Florida’s hot climate means that we rely on our air conditioning systems to deliver cool, comfortable air when we need it. 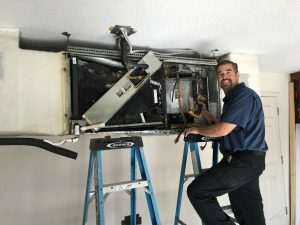 At Complete Pro Air we bring over a decade of experience to the job so that Brandon AC Repair, Installation or Maintenance is always done fast and done right. Whether you need an emergency repair or it is time to replace your old system with a newer and more efficient one, we are ready to serve. We have a firm belief that you deserve fast, professional service from a team of technicians who you can trust. We are experienced with a wide range of units from many manufacturers and can help you beat the heat fast. When you call people to work in your Brandon home or business, you want them to be prompt, groomed and professional. We care about your safety and comfort, so we send only skilled and vetted workers to you. Every one of our technicians is background checked, drug tested and show up time, every time. All of our technicians are NATE- and EPA-certified. They are experienced with a range of air conditioning brands and manufacturers. Their skill and experience mean that they can diagnose problems quickly and get your residence or business cool and comfortable again. In most cases, what you need when your AC is not performing as it should is AC repair. However, when a unit is old or badly damaged, a replacement air conditioner provides a better value. A replacement AC is a significant investment. We offer free estimates on AC replacements so that you understand the potential costs up-front. There is no obligation on your estimate. We want you to understand your options so that you can pick the one that fits your budget and your situation best. We take pride in on-time appointments so that you are not stuck waiting for the AC services that you need. Call us today for air conditioning maintenance, repair, installation or replacement services. We will inspect your unit and provide an assessment of what is needed. Whether you are looking for Brandon AC Repair, Installation or Maintenance within the Tampa Bay area, make sure you call Complete Pro Air first.